The key to making waffles with crunchy outside but soft inside, your waffle machine has to be heated up nice and hot before pouring in batter. Don’t cook too long though, or else the waffle becomes dry. 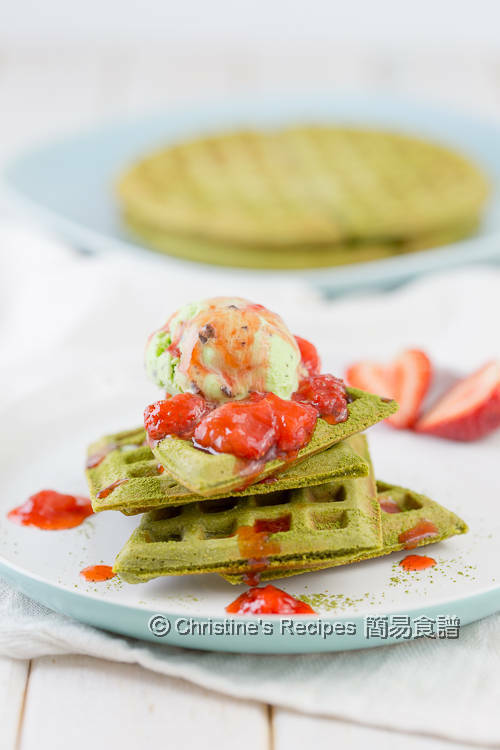 What I like about these matcha waffles is their beautiful green colour and aroma. This dessert dish perfectly brightened up my day. 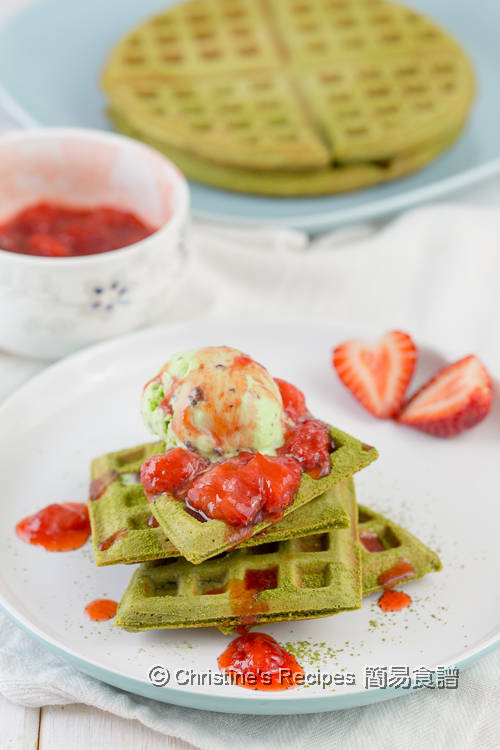 Enjoying a scoop of my favourite ice-cream with these matcha waffles in a warm sunny afternoon, it’s absolutely a bliss. A good quality matcha power is everything. It gives you the beautiful green colour and a pleasant green tea aroma. Strawberries are in season and on sale in supermarkets recently. 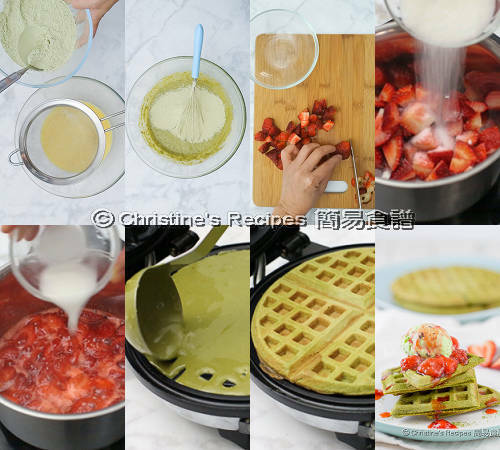 Why not whip up some strawberry sauce to go with these waffles? As expected, strawberry and matcha are good partners to make you a perfect dessert. They won’t let you down. To prepare strawberry sauce: Trim and discard the stems of strawberries. Roughly chop. Put in a small saucepan. Add sugar and lemon juice. Cook over medium heat until the strawberries get soft and break down. Mix corn flour and water. Stir into the strawberry and cook to preferred consistency. Set aside. Sift cake flour, baking powder and matcha powder through a fine sieve. Add a pinch of salt. Combine well. Use a whisk to mix the eggs with sugar well. Pour in milk and vanilla extract. Stir in the melted butter. Sift in the flour mixture in 3 batches into the egg mixture. Lightly combine. Don’t over stir it as you don’t want your waffles turn tough. Let the batter rest for 10 minutes. Meanwhile preheat a waffle machine. Lightly mix the batter again. Pour in batter onto the nice and hot waffle machine according to user manual. Cook until surface turns light brown. 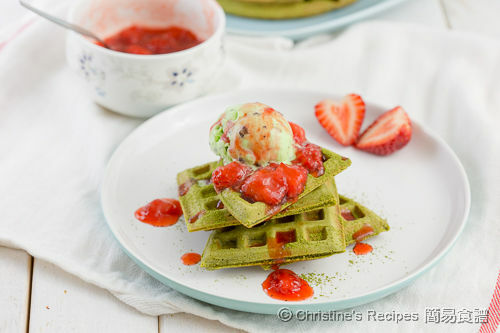 Sprinkle some matcha powder on waffles. Serve with favourite ice-cream and strawberry sauce. Enjoy! 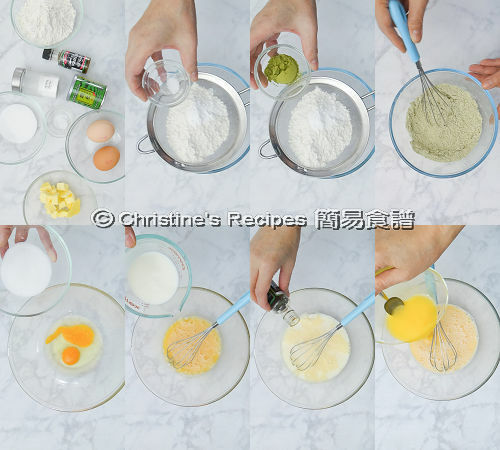 While making the batter, just combine all the ingredients. Don’t over mix it. If you spot some lumps in the batter, it’s fine as long as they are not too large. If the batter become thicker after resting, you may add a little of water to adjust the consistency. Heavenly! The colour contrast of green tea and red berry is stunning.